Our charging station is absolutely non profit and non commercial. And of course we can not take any liability. Nevertheless do we, of course, appreciate a voluntary donation, which covers our electricity costs. That was one of the reasons for us do develop the software, so everyone who uses our charging station can see how many Euros went in his or hers battery. Who wants to leave a cash donation can use the donation box behind the charging station. 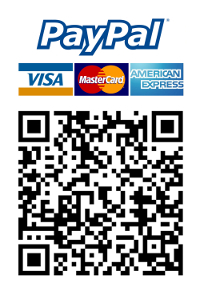 Who prefers to donate online can use the Paypal QR-code on the station with his / her mobile phone. Or just click this link https://www.paypal.com/de/cgi-bin/webscr?cmd=_s-xclick&hosted_button_id=JVLHSUHKFLGU2 directly.